Fabric Kit includes the pieced pattern and fabric to make the quilt top and binding as shown in the quilt image. 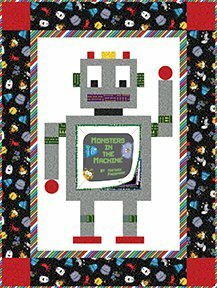 Fabric kit features the "Matthew's Mini Monsters" fabric line designed by The Whimsical Workshop's own Matthew Pridemore. A soft book forms the robot's belly.